Aspirin (acetylsalicylic acid) is one of the most famous and popular medicines. Every year the world consumed about 80 billion tablets of aspirin. But why this drug is so popular, what diseases it helps? Aspirin is antipyretic, analgesic and anti-inflammatory. Even very far from the medicine man knows that aspirin not only quickly reduces the temperature, but also has a pronounced analgesic effect. Why is this happening? The fact that acetylsalicylic acid has a depressant effect on the parts of the brain that are "responsible" for thermoregulation and pain sensitivity. In addition, acetylsalicylic acid inhibits the activity of some enzymes, cyclooxygenase, involved in the synthesis of prostaglandins (mediators of inflammation). As a result of inflammatory processes begin to leak less active and eventually completely fade. This is very important in cases where the inflammatory process in the body can lead to serious consequences, such as rheumatism. Therefore, aspirin is highly effective in the treatment of various inflammatory diseases and diseases that cause high temperature and pain syndrome weak or moderate intensity. In addition, this medication is cheap and available to almost any buyer. All this together made aspirin hugely popular drug. Finally, acetylsalicylic acid thins the blood, reducing the likelihood of "bonding" of platelets. Therefore, aspirin plays an important role in the prevention of heart attacks, strokes. 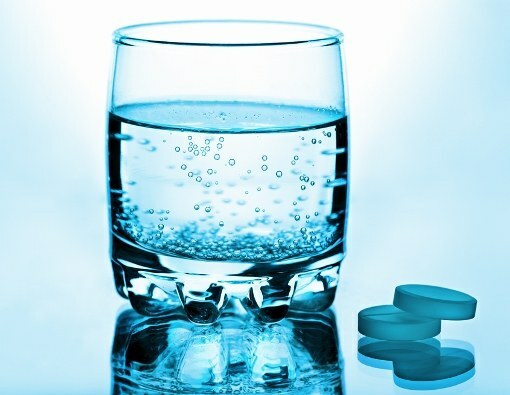 The same people who have suffered heart attacks and strokes, necessarily designate acetylsalicylic acid to prevent recurrence of these diseases (of course, in the absence of contraindications). As mentioned, acetylsalicylic acid inhibits the activity of cyclooxygenase enzymes. However, one of these enzymes contributes to the normal functioning of the gastric mucosa. Accordingly, his blocking could lead to the development of ulcers. Therefore, aspirin is not prescribed to patients with diseases of the stomach. Aspirin is strictly contraindicated in low blood clotting. It should also be very careful to use pills during pregnancy (only on prescription and under his control). In patients suffering from bronchial asthma, high dose of aspirin may provoke a severe attack. That is why to use this remedy is undesirable.